Jesse van de Hulsbeek is the Yoast Academy lead. He creates SEO training courses and works on the Academy's didactic methods. Mark your calendar! On November 20, we’re broadcasting our first ever Yoast Academy webinar: SEO in 2019. What’s going to happen in search next year? And, what does this mean for your website? 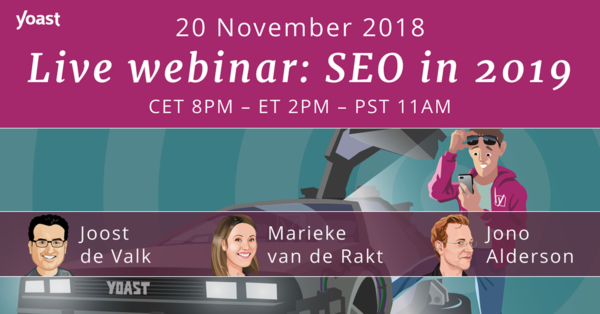 In this webinar, Joost de Valk, Marieke van de Rakt and Jono Alderson shed their light on SEO in 2019. This is your opportunity to hear from these experts what to expect and how to prepare yourself! Best of all, it’s completely free and easy to attend. Oh, and by the way, we’ll announce an exciting new product in this webinar as well. The webinar is a one-hour show in which we’ll talk about SEO in 2019. 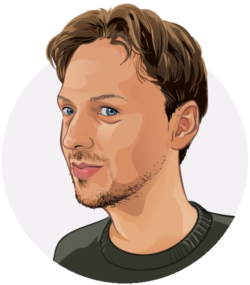 Joost de Valk will kick off with a talk on the most important trends in SEO. After that, Marieke van de Rakt and Jono Alderson will join Joost in a round table discussion on one of these big developments: context and related search entities. We’ll cap things off with a live Q&A session in which you can ask questions to our panel of experts. Already have a burning question about the future of SEO? Leave it in the comments and we may answer it in the webinar! How can I attend the webinar? The webinar will be streamed on YouTube live on November 20. Visit https://yoa.st/yoastwebinar to attend the stream. You can also subscribe to the Yoast channel on YouTube and you’ll be notified when the stream starts. There will be no login or other requirements. Simply visit the page and enjoy! In the table below, you’ll see when the webinar starts for a number of common time zones. Add the Yoast webinar to your calendar! (iCal event: click the link and download the ics file. Open the file, select your calendar and save the date. All the details (URL etc) are included in the event!). If you can’t make it and want to watch the webinar at a later time, no problem. It’ll be freely available in our Yoast Academy afterwards. You’re probably pretty curious about the new product we’re announcing. We can’t give away too much, of course. All we can say, is if you’re a true Yoast-fan and want the full Yoast experience, you’ll probably be pretty stoked. I know we are! The first ever Yoast webinar will be broadcast on November 20. Attend it for free at https://yoa.st/yoastwebinar or subscribe to the Yoast channel on YouTube. See you there! Will it be in Yoast Academy Right After of some days later! Is Academy also free? How close is Google directing the SEO future to the way people speak naturally, to include even incorrect grammar, frustration words (are those related entities? ), and profanities? Looking forward to it. Thank you. I have done quite a lot of SEO on my website and still do not see the required results…and may I say, the whole concept is a huge learning curve for us older, non techies. Yoast is installed on my 2 blogs but I need to better understand the product features to organically improve my search results. I hope this webinar is the first in a series. Count me in… Whiii wow! Webinar and news – What could be better? Always ready to be ready … for SEO learning and more! Thankyou for this webinar! Excited to attend this webinar. Will I be able to watch this later on YouTube if I’m not able to watch it live? I want to participate in this seminar.I live in Brazil.At what time the seminar will take place for me in Brasilia the capital of the coumtry ? Hi Edgard! You can add the Yoast webinar to your calendar by clicking the link in the text (https://yoast.com/app/uploads/2018/11/Yoast_webinar_SEO_in_2019.ics) and then it will show up in your calendar in the local time. Hope you’ll join in on November 20! Price is too high and unfortunately I cannot afford it. Being from India and Aged 80 — I feel i cannot pay it. You’re in luck! This webinar is totally free of cost! See you on November 20? Really looking forward to the seminar! We will have our entire marketing team sitting in on it! Unfortunately I’ll be otherwise occupied. Can I view the webinar at a later time? Yes, you can watch it later in Yoast Academy! Could also not make it. Is it also free in the academy? Thanks for sharing very valuable content! The Yoast SEO plugin is amazing, a must use plugin for perfect seo optimization. Hi Joost we use your paid product on our website and love it. One thought, you will get far more attendees with a calendar download, which includes the access details, than hoping people remember the email or take the time to copy over to their work calendar. A significant amount more. Paul McDevitt is right about that calendar download. So easy for me to add it to my calendar! I’m so glad I have a wordpress site so ai can have the benefit of YOAST analytics, y’all absolutely Rock! Is there a way to set up an alert from Yoast to notify us if our SEO on a particular website page falls below a certain ranking? Thanks for your question, Caroline! We’ll add it to the list. I can’t figure out how to register for the webinar. There is no CTA that jumps out at me. Is there an actual registration page? …or do we have to subscribe to the YouTube channel and hopefully remember when it is going to be live there? Hi Bob, you don’t have to register! If you just follow the youtube link you can set a reminder there. I watched the 15 minute SEO updates video yesterday (great video) and came away wondering how you validate the SEO and Readability evaluation criteria. They make sense and they’re aligned with what other SEO and content marketing experts say. However, if you really wanted to validate the criteria, you’d do some testing — perhaps you’d change the content to change the evaluation ratings for a number of website pages. Then you’d use statistical techniques to determine whether those evaluation rating changes had statistically significant impacts on rankings. Thanks! I know keyword cannibalization is a bad thing, however we have hundreds / thousands of videos about our shows. When selecting a keyword, the show is ultimately what we’re wanting to promote/have come up in searches without getting too granular. Any recommendations? Thanks for your question, Jason! We’ll add it to the list. I’m already receiving an email newsletter from Yoast. Is the Free SEO tips with free SEO for beginners course different? Tags and categories. Couldn’t we just use one or the other? Thanks for your question, Floriginian. We’ll add it to the list!